Home→Edible plants→Fruiting plants→A multitude of mulberries! We’ve never had this many mulberries growing at a time! 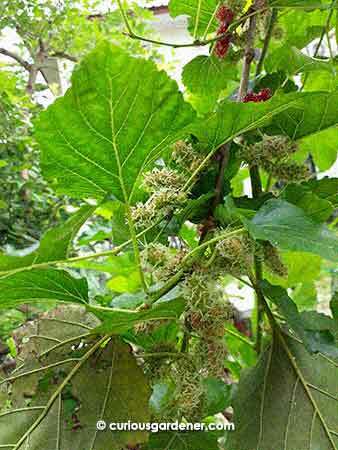 I couldn’t believe my eyes when I looked at the mulberry plant this week. It’s one of those plants that doesn’t require lots of attention, apart from regular pruning. As a matter of fact, this plant started as a cutting in a pot, that sneakily took root through a crack in the cement paving it was on. It has been in this location for more than half a year and was pruned about a month ago when we were clearing the garden before Christmas. 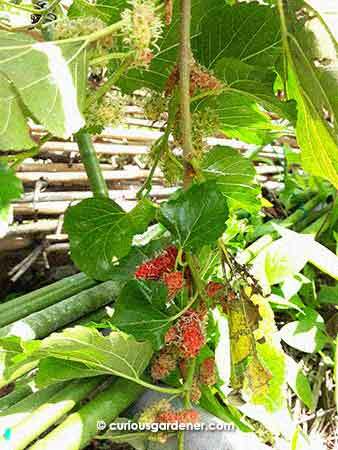 Prior to this, it bore fruits in small, scattered clumps like our mulberry plants normally do. So, I did a double-take and had to take a closer squint at the branches when I saw the incredible number of mulberries lining the branches! What you see is just part of the branch – imagine a 2-metre long branch lined with clumps and clumps of mulberries! © 2019 curiousgardener.com All rights reserved.